Detective Malcolm “Mace” Douglas (Marinaro) is a cop who plays by his own rules and has a bad attitude. His partner Cain (Larson) is the opposite: a clean-cut, by the book kind of guy. While working the vice squad, they see the seamier side of life on the Atlanta streets: drugs, prostitutes, and street crimes of all types. When the strippers at the Fool’s Paradise club start dying of supposed heroin overdoses, Mace investigates and finds that there’s a conspiracy that goes somewhere...oh yeah...all the way to the top! The FBI and the KGB are involved, with connections to a shadowy figure hiding behind his “diplomatic immunity” (Goz) and his partner Flexnor (Washburn). Will Mace mace his way through this maze? 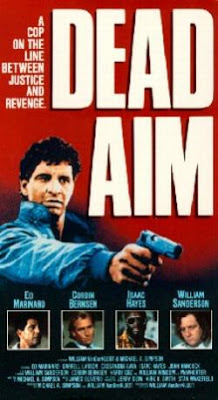 Dead Aim is an entertaining cop drama/thriller with Ed Marinaro fitting the role of the Cop On The Edge nicely. 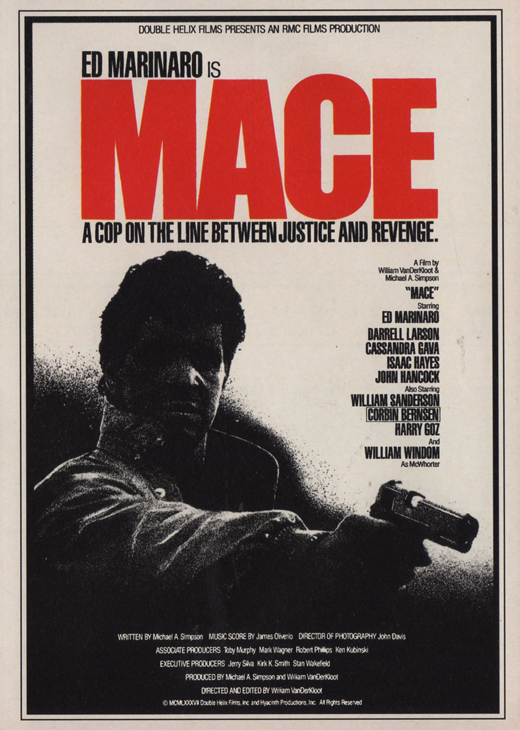 One of the things about this movie that is so enjoyable are all the classic cop cliches: There’s the prerequisite BYC (the Black Yelling Chief for those who don’t read the site regularly), he yells that Mace has “the highest mortality rate in Metro!”, and naturally, thanks to Mace’s rogue ways, later in the film he says the classic “give me your gun and badge!” There are other cliches as well, but thankfully they’re all done well, and Dead Aim as a whole is not bad thanks to some good acting, decent ideas and a few nice directorial touches. There’s an attempt at some realism, and the plot that delves into the seamier side of life is reminiscent of Stripped To Kill (1987) and the Wings Hauser vehicle Vice Squad (1982), among others, as it was a popular subject at the time. You gotta love that red lighting and neon atmosphere. The fact that there’s a stripper named Misty (Sandi Brannon) should tell you all you need to know: we can all nostalgically sigh about when girls were named “Misty”...it truly was a different time. And while Ed Marinaro wouldn’t wow us again until The Protector (1999), let’s not forget about his co-stars here: Corbin Bernsen of all people is on board right before his success with L.A. Law happened. Isaac Hayes plays Jamal, a crime lord with an unidentifiable accent and some cool threads. For no explained reason, he’s protected by an army of Asians at all times. Besides the aforementioned Washburn and Goz, there’s also William Sanderson as the lab tech, and William Windom is here too. So the cast does add some extra texture to this tale. So for more of the quality end of the sleaze spectrum (it’s really not all that sleazy), see Dead Aim, as it remains a cliche-ridden good time. Keep in mind that’s not an insult. Vestron released it on VHS back in the good old days. If you can find it cheap, check it out. Sounds like it would make a good pairing with One Man Force. Absolutely! That would be a fun double-feature. One Man Force is a classic. code red is going to be putting this out on DVD. Finally! It deserves a dvd release.